These are problem cards. The students should use (must, musn´t, should or shouldn´t or have or have to)to give some advice. Hopw you´ll like it.! 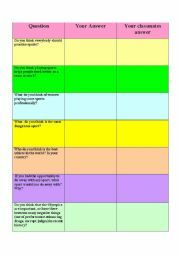 This is a snakes and ladders board game if you are teaching body parts.It´s fully editable.Hope you find it useful. Lastra, thank you so much for this excellent template. It´s clothes domino. 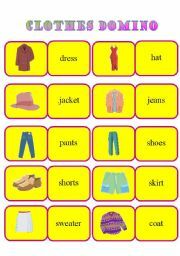 useful for drilling clothes vocabulary and words. I would like to thank the author of this template. It is a great help! Hope you guys will download it! it´s a snake´s and ladder´s board game where students could practice stationery items. I hope you guys will find it useful! it´s a questionnaire about sports. 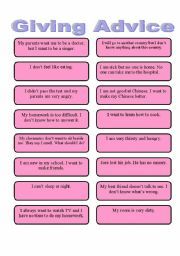 students ask each other using this worksheet. 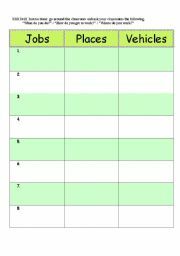 It´s a mill drill activity.If you are teaching jobs, places, and transports you can use it. Students ask each other and write down their survey. At the end, they report their survey in the class. Hope you will like it! 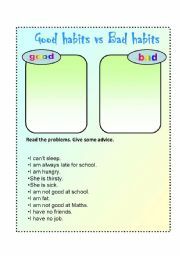 they write good and bad habits. they also give an advise to each problems using modals should etc.